Business Insider/Sam SheadShazam cofounder Dhiraj Mukherjee. The chance of music identification service Shazam working out was just 4%, Shazam cofounder Dhiraj Mukherjee said on Wednesday. 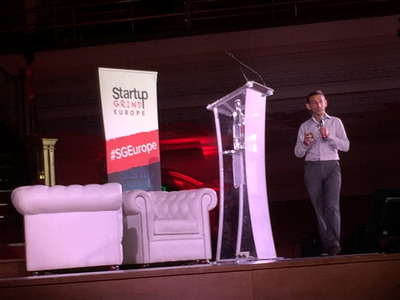 Speaking at the Startup Grind Europe conference in London, Mukherjee said he calculated the figure in the company’s early days after realising that the chances of creating Shazam’s complex technology was just 25%, while the chances of “finding all the music” was around 30%. “We were writing business plans and financial models and projecting revenues of hundreds of millions of dollars long before we had the technology,” admitted Mukherjee, who now works at Virgin Money, where he’s head of banking innovation. Shazam was founded in 2000, one year before the dot.com bubble burst. “There was blood on the streets and we needed to raise $8.5 million (£5.9 million) on the back of a powerpoint and a demo,” said Mukherjee. Fortunately for Shazam, the company was able to raise the funding it needed, although it wasn’t easy, according to Mukherjee. “There were 53 VCs in London and 50 of them rejected us,” he said. Jump forward to 2016 and Shazam has raised more than $136 million (£96 million) and is valued at over $1 billion (£704 million). It has over 100 million monthly active users and has been used on more than 500 million mobile devices.